Futures for the Dow Jones Industrial Average today (Thursday) forecast a 72-point drop on the final trading day of 2015. 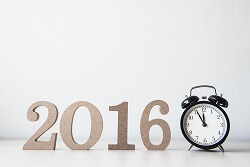 As traders prepare for New Year's Day and the start of 2016, markets will close today at their regular hour – 4 p.m. EST. The markets will be closed on Friday, Jan. 1, and regular trade will resume on Monday, Jan. 4. Here's a breakdown of how you can become a better trader in 2016… if you just follow these very simple words of advice. Yesterday, the Dow Jones Industrial Average dropped 117 points as oil prices declined again and International Monetary Fund managing director Christine Lagarde projected a disappointing growth forecast for 2016 and beyond. Lagarde warned a stronger U.S. dollar could fuel a wave of bond defaults by foreign companies, which would "infect" banks and global economies. The Stock Market Today: On Thursday, traders will take to their stations for the last session of 2015. A light economic calendar features a weekly update on jobless claims and a critical December update to the Chicago PMI. Economists are looking for a positive report after the region suffered a contraction in manufacturing activity in November. On the international front, Mexico's central bank will release minutes from its recent monetary policy meeting where it elected to hike interest rates for the first time since 2008. Alibaba Stock Forecast 2016: The Alibaba stock price is down 21.01% after its first full year of trading in 2015. But the turnaround is in play. Our Alibaba Stock Forecast 2016, which you can read right here, shows the stock's rebound will continue in the coming months. You won't want to miss one of the best investment opportunities of the year. Oil Outlook: Oil prices were off due to concerns of oversupply after the U.S. Energy Information Administration announced domestic crude inventories increased by 2.6 million barrels last week. February's WTI prices were down 0.8% at $36.29 per barrel. Meanwhile, Brent oil crude – priced in London – fell 0.5% to hit $36.28. Today, the markets will be keeping an eye the weekly Baker Hughes Inc. (NYSE: BHI) rig count, which offers an update on oil production levels in the United States. Earnings Outlook: No major U.S. companies are expected to report earnings on Thursday. Stocks to Watch No. 1, CHK: Shares of the nation's second-largest natural gas producer, Chesapeake Energy Corp. (NYSE: CHK), continued to crater. The stock fell another 3.1% on Wednesday as oil and natural gas prices continue to decline. CHK stock was the worst performer of 2015 on the S&P 500, falling roughly 77% over the last 12 months. Suppressed commodity prices have made it very difficult for the company to handle the large amount of debt on its balance sheet. Stocks to Watch No. 2, KBIO: Just two weeks after its former CEO Martin Shkreli was arrested on charges of securities fraud, biotech firm KaloBios Pharmaceuticals Inc. (Nasdaq: KBIO) has filed for Chapter 11 bankruptcy. Earlier this week, the Nasdaq exchange operator alerted the firm that it would be delisted from the index. The company said it will appeal the decision, but the bankruptcy decision is likely to hurt its efforts. Stocks to Watch No. 3, GE: Shares of General Electric Co. (NYSE: GE) announced plans to split its renewable energy business from its power division. The decision comes after the company purchased Alstom's energy business, an acquisition that generated significant concern in Europe over antitrust considerations. The new decision will center on Alstom's wind- and hydro-power operations and GE's legacy turbine business.